In Saturday morning, before FD starts, the Field Day Chair, Dee N8UZE (in turquoise blouse above the hat) goes over the rules and plans for ioeration this year. On Saturday morning before FD starts, Boy Scout Troop 788 from Redondo Beach arrives to set up the GOTA station that operated as W6BAC. 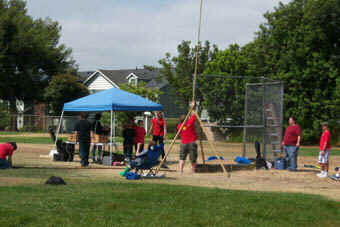 The Scoutmaster, Brett W6BAC, can be seen making adjustments to the center pole for the trapped dipole antenna. 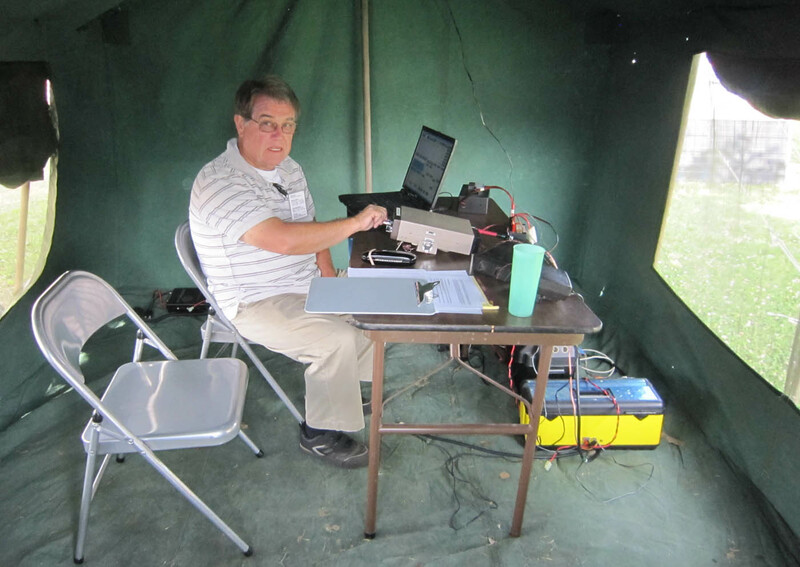 The OCARC Field Day Chair, Dee N8UZE, takes a turn at operating the 80M/10M station during FD. 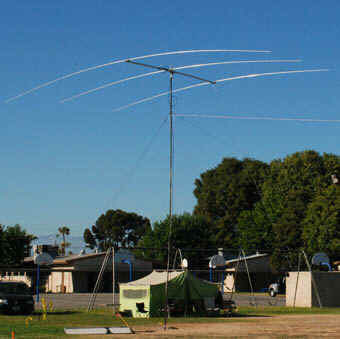 A 80M dipole was used for 80M. 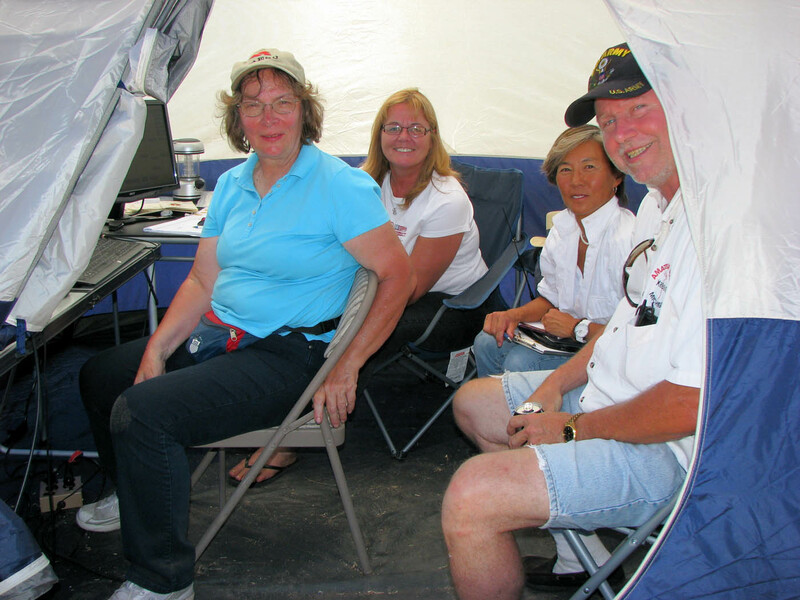 (L-R) Dee N8UZE, Carla KJ6YOW (her 1st FD! ), a visitor friend of Tim N6GP, and Carl N8AE. Nick KD6IPE was the band-captain of the 80M.10M station/ In the background is Carl N8AE. 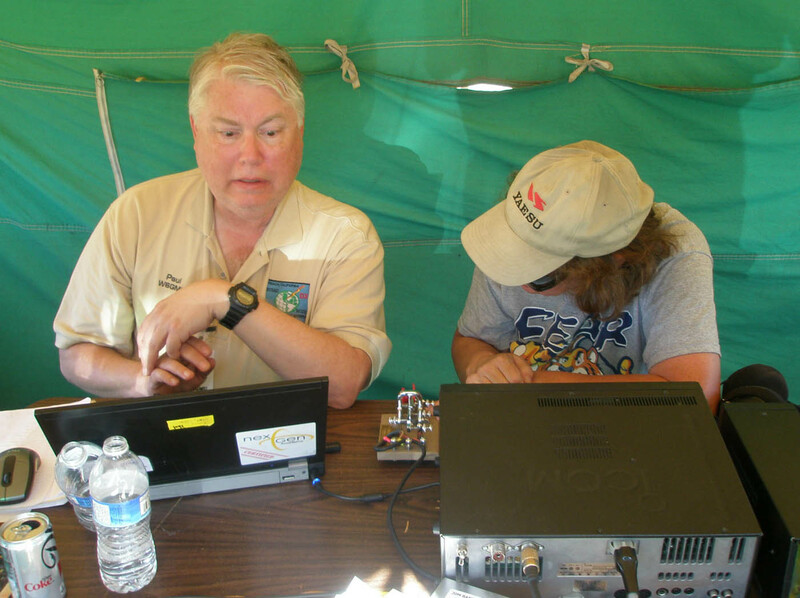 Here is 40M/15M station with co-band-captain Tim N6GP doing the operating and logging. John WA6AJE operates the 40M station in the middle of the dark night during the "grave-yard shift". 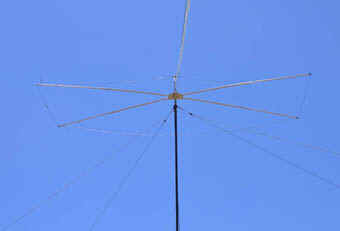 The 40M station used a two-ele inverted-Vee beam. Ladder line was used for the feedline and the active element. 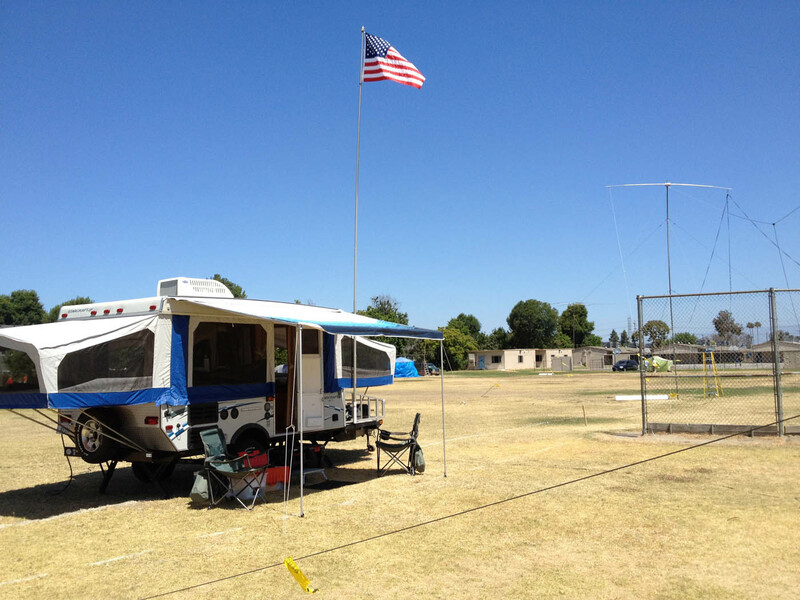 The reflector is at the far end of the boom. 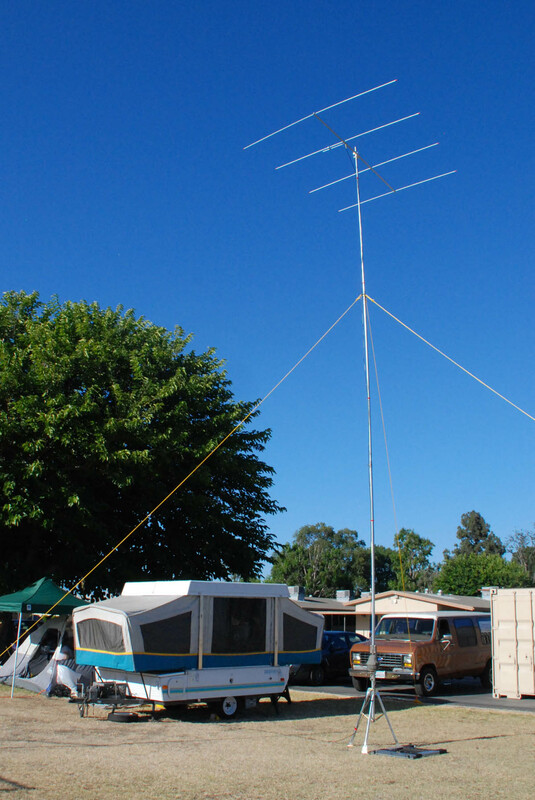 A 2-ele 15M Moxon beam antenna is mounted on a military stacking-mast tower. 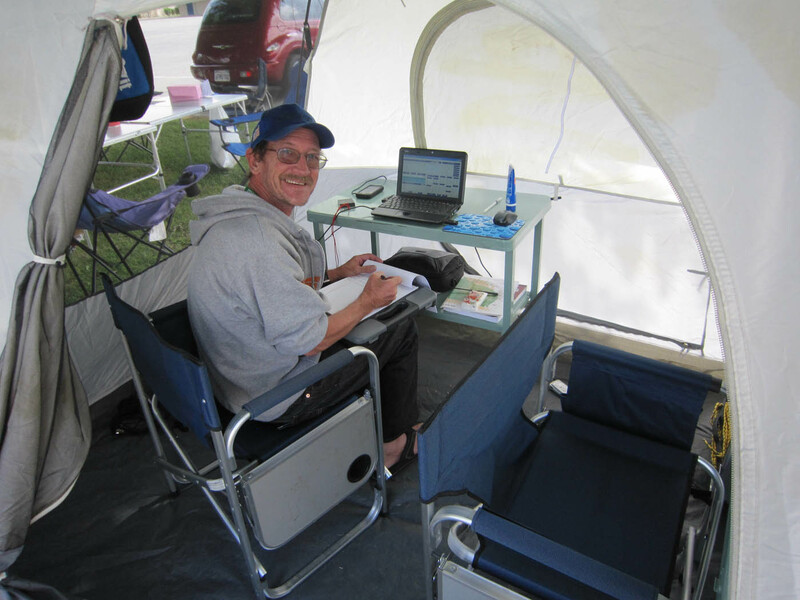 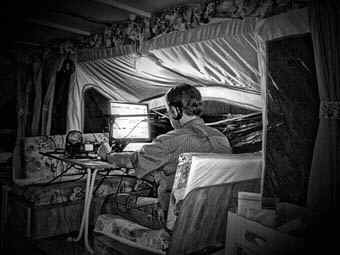 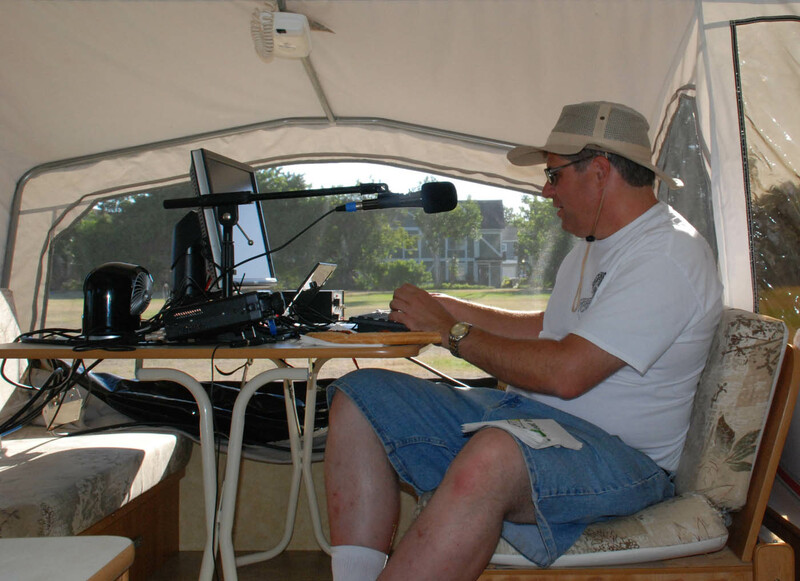 The 40M/15M station was housed in the tent-trailer pf Doug W6FKX. 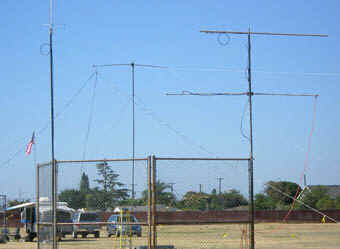 The 40M antenna can bee seen on the right side, beyonf the backstop. 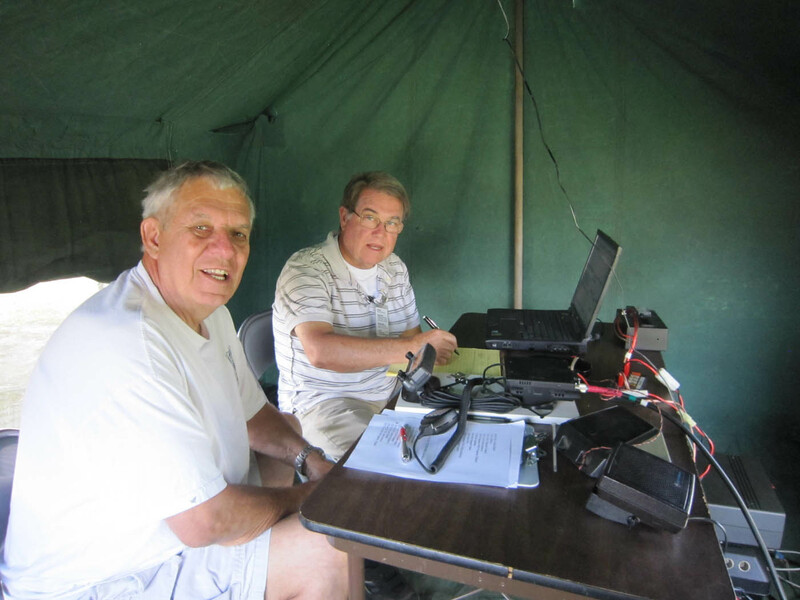 The 20M CW station (L-R) has Frank W6NKU doing the logging (his first FD in many years) and Paul W6GMU was the band-captain for the station. This photo shows the 20M CW station with Paul W6GMU logging and Dee N8UZE doing some operating. 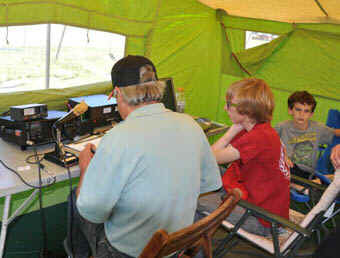 This photo shows the tent for the 20M CW. 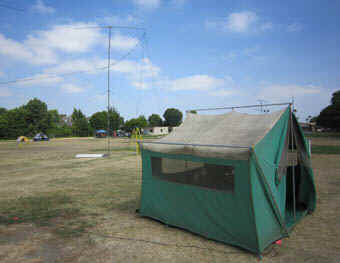 The tower in the backgound is for the 40M inverted-Vee beam (that also supports the 20M CW double=bazooka antenna. 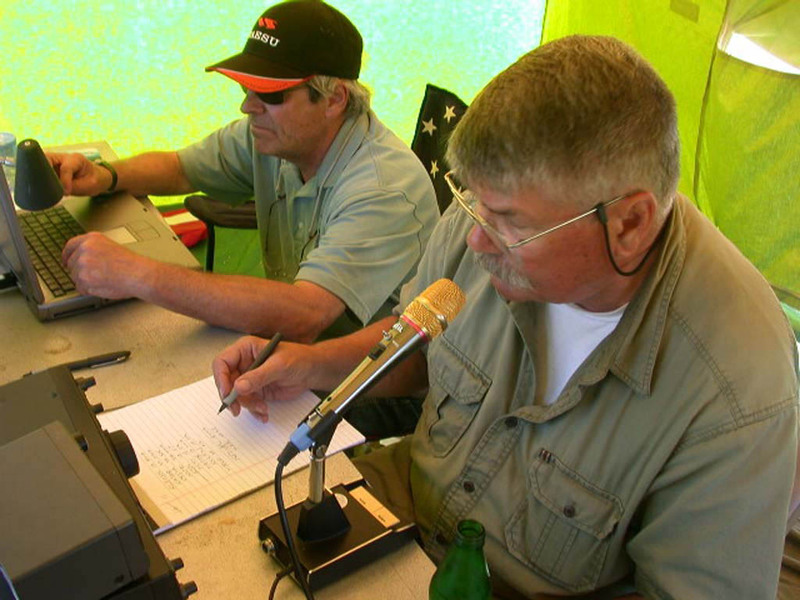 The co-captains for 20M PHN are Bob AF6C (logging) and Ken W6HHC (on the mike). Shown are co-20MPHN-captain Bob AF6C on 20M PHN with scout Kyle Bohlander taking a turn at logging, while Adam son of member Tim KJ6NGF looks on. 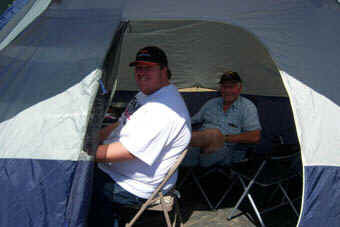 Later Adam took a turn logging (with a little assist form his dad). Operating the mike on 20M is Ken WB9YCJ with Bob AF6C trying to keep up with the logging during a pile-up. Here is a photo of the 20M PHN 3-ele mono-bander beam up at 30 feet on military stacking mast and the operating tent. 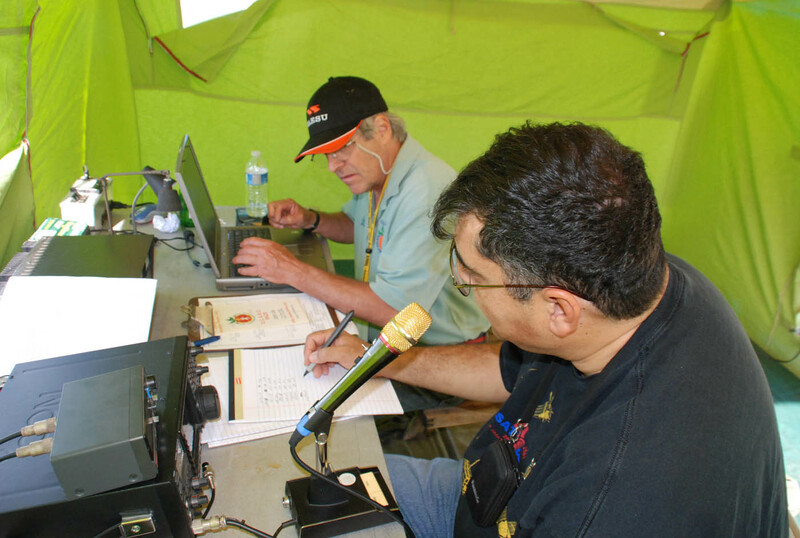 Jay KI6WZU inside the 6M station works off a few more QSOs. 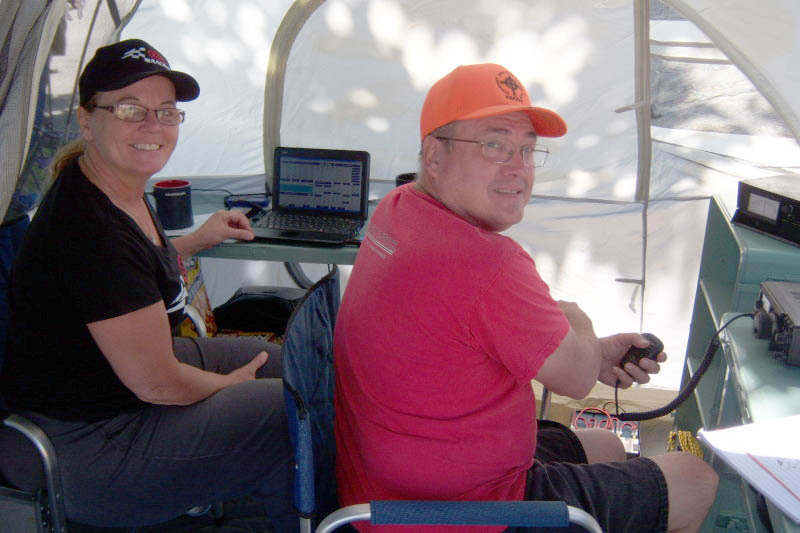 Carla KJ6YOW is logging for Atlee N2CNC in the 6M tent. 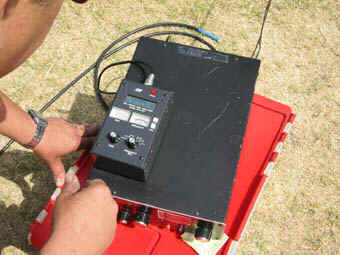 BTW-Atlee is the brother of Jay KI6WZU. 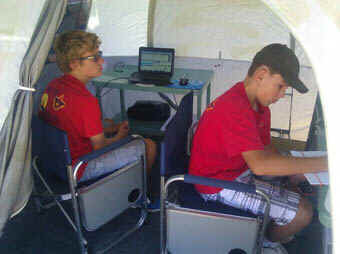 Two scouts (L-R) Colin Hoyer and Bryan Cloutier take a turn operating the 6M station. 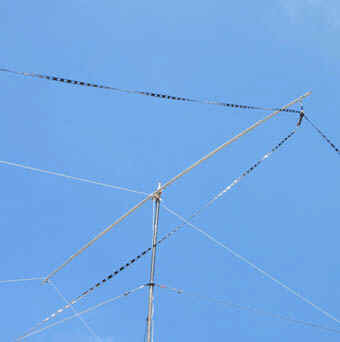 Here is a photo of the 6M 4-ele beam in action on top of the tower. 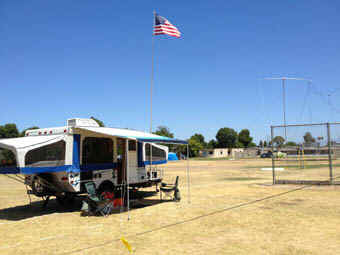 The gray 6M tent can be see to the left of the tent-trailer that served as resting quarters for Jay-KI6WZU. Robbie KB6CJZ was the captain for organizing both the VHF and UHF stations. 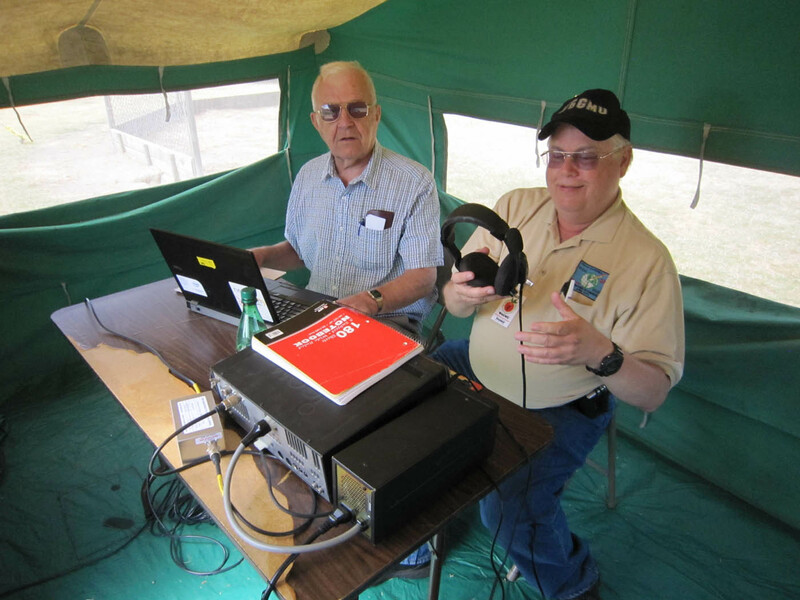 Joe KE6ZMG (on left) takes a turn to work his first ever Field Day with assistance from Robbie KB6CJZ in the 2M/440 tent. Seen here are some of the antennas for the VHF/UHF tents. 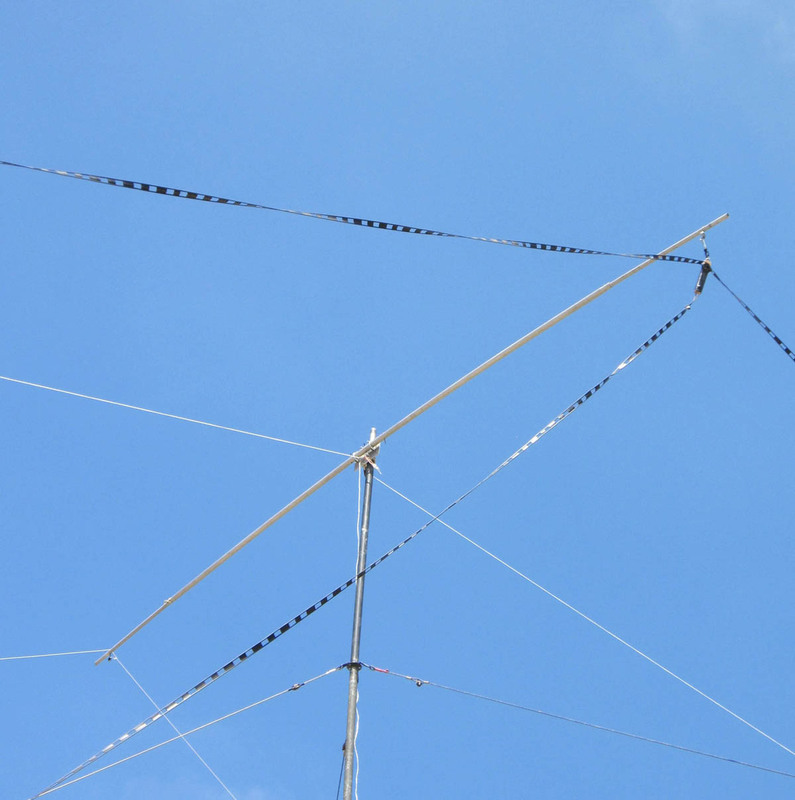 The vertical antenna to the left-side of photo is for 2M-FM/220MHz. 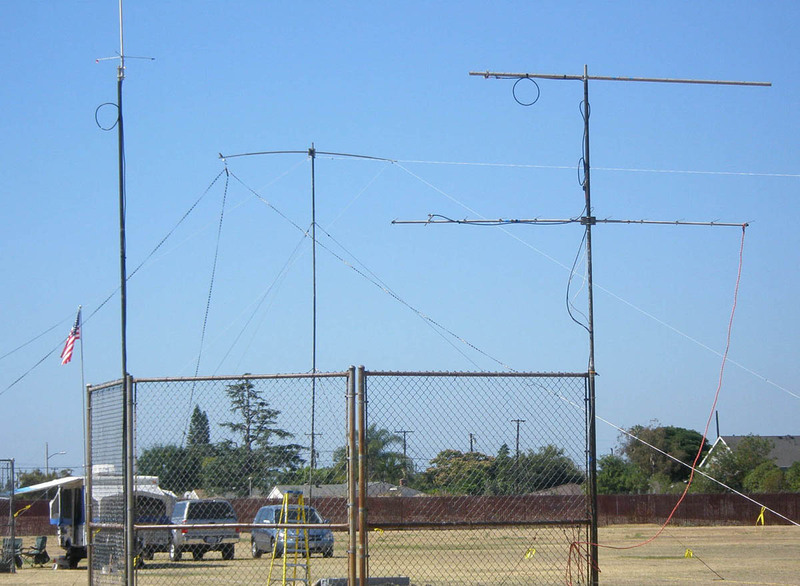 The top yagi on the left-side mast is for 440 MHz and the lower yagi on that mast is for 2M-SSB. 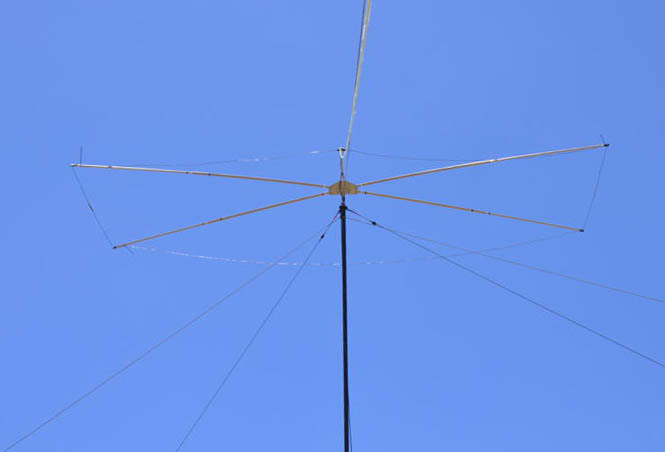 The tower in the middele is the 40M beam on a 35-ft military mast.